Compliant mechanisms are defined as those that gain some or all of their mobility from the flexibility of their members. 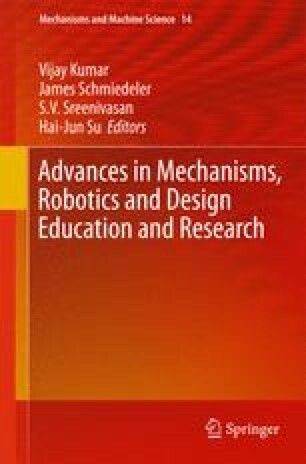 Suitable use of pseudo-rigid-body models for compliant segments, and state-of-the-art knowledge of rigid-body mechanism synthesis types, greatly simplifies the design of compliant mechanisms. Starting with a pseudo-rigid-body four-bar mechanism, with one to four torsional springs located at the revolute joints to represent mechanism characteristic compliance, a simple, heuristic approach is provided to develop various compliant mechanism types. The synthesis with compliance method is used for three, four and five precision positions, with consideration of one to four torsional springs, to develop design tables for standard mechanism synthesis types. These tables reflect the mechanism compliance by specification of either energy or torque. The approach, while providing credible solutions, experiences some limitations. The method is not yet robust, and research is continuing to further improve it. Examples are presented to demonstrate the use of weakly or strongly coupled sets of kinematic and energy/torque equations, as well as different compliant mechanism types in obtaining solutions.